The latest expansion to Dominion takes thing to an "epic" scale. I feel like I'm playing a super-sized Dominion... money, points, effects, they're ALL bigger. Who doesn't want more? And yet, the game doesn't seem to play any slower than before. This is our favorite Dominion expansion. The new cards have new as well as reliable "powers". And it's nice having new and "more expensive" treasure and victory cards to spend your treasure on. The shortcoming with Dominion is the inconvenience of pulling out the various big boxes if you want to mix action cards from the base game and expansions. 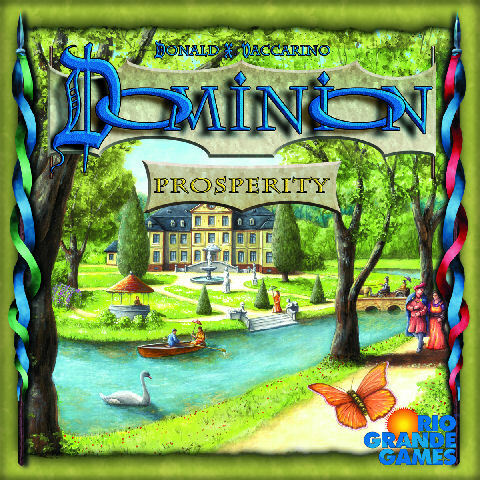 But if you take the base Treasure, Victory, and Curse cards from a base Dominion game, Prosperity is actually well-rounded enough to serve as a decent version to play on its own if you happen to want to tote just it along to a game playing night. There are extra spaces in the card tray to hold all the base game's cards (not including the 25 base Action/Kingdom cards). Awesome expansion; the more expensive and more powerful cards really add some punch to the gameplay. The big money cards also add new paths of strategy...counter the Province rush with the new Colonies, which are worth 10 points each! If you've played Dominion before you have probably gotten the 7-coin hand before and been stuck between 6-cost and 8-cost cards. Now we have cards that cost 7, as well as a bigger treasure and a bigger victory point card. I also like the addition of point tokens. You can get points without clogging up your deck. As with other Dominion expansions, it adds a lot to the game and is worth getting. Probably my favorite of the Dominion expansions so far. I love the extra dimension the Colony and Platinum cards add to the game. Since I mix all of the Dominion decks together when I play, I record all of my plays under the Dominion base game.